Rogue Folk Club presents the first annual BC Fiddle Festival! 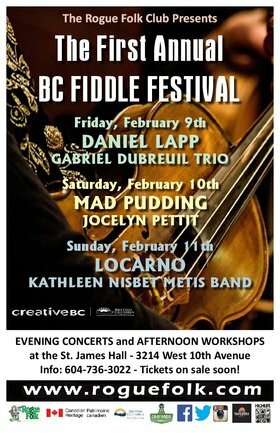 Please visit http://www.roguefolk.bc.ca for full event details and schedule. Advance tickets available on our website, at Tapestry Music Vancouver, and at Highlife Records. Everyone who attends one or more workshops will receive a Rebate Coupon at the workshop which can be redeemed for $7 off at a concert (space permitting.) Please note that workshop tickets are not available at the outlets — they must be purchased online or at the door.